Executive Chef Jon Hung is the new secret ingredient at The Raymond 1886, whose brother is none other than Los Angeles based Chef Michael proving that talent, culinary ingenuity, and a keen sense of business runs in the family. Before his cross-country move to helm the kitchen at The Raymond 1886, Executive Chef Jon Hung was most recently at the highly collaborative restaurant Common Lot in New Jersey, which was awarded 4 stars by the New York Times. Chef Hung began his career in New Jersey as owner and operator of The Bagel Box, during which time he received his Certificate of Culinary Arts from The Art Institute of New York. These experiences set the foundation for Chef Hung’s trek towards a new frontier at The Raymond 1886, where his fifteen years overseeing all aspects of his own business made him cognizant and empathetic of all restaurant operations, while his team work skills at Common Lot gave Hung the training ground to create a collaborative environment in the kitchen. “I consider it a failing of my leadership if I do not support the creativeness of my team.” For his all new dinner menu at The Raymond 1886, Executive Chef Jon Hung has stayed within the parameters of tradition while still coloring just outside the lines in texture and flavor profile. 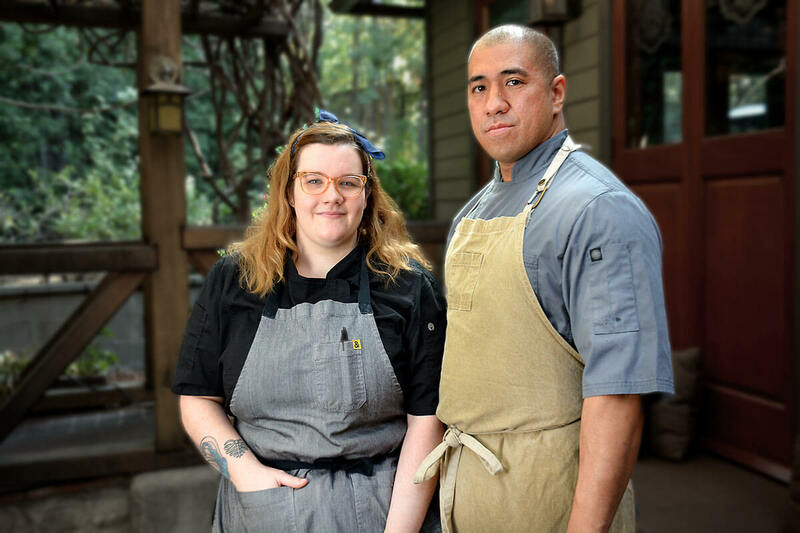 The Raymond 1886’s Pastry Chef Alexa Clark is the sweet to Executive Chef Jon Hung’s savory. Calculated and thoughtful, Clark’s career began immediately following her completion in Pastry and Baking Arts at The Institution of Culinary Education in New York, and in New York and New Jersey based kitchens such as TriBeCa Treats, No Nut Nation, and Local Seasonal Kitchen, before gaining recognition for her contributions at Common Lot and Viaggio Ristorante, with whom she was profiled in the April 2018 issue of New Jersey Monthly. Hung and Clark met at Common Lot and quickly discovered a similar work ethic that only strengthens under the same kitchen roof, synergistically playing off one another with their supportive palates. Clark knew from the get-go that her approach to The Raymond 1886 new dessert menu would be about perfecting balance. Says Clark, “Guests want something they cannot easily make at home, but something that is also familiar.” Clark walks that tightrope with the greatest of ease seen in her delectable treats. Always seeking new opportunities to expand her prowess, Clark has also had the chance to get behind the bar and collaborate with the critically acclaimed 1886 bar team for their new Cocktail Menu and she is looking forward to more collaborations with the 1886 team coming up.